4D is really an investment in those who want to make a greater contribution to their tribal communities. Partnership With Native Americans (PWNA) recognizes that leadership development is a critical step toward our vision of strong, self-sufficient Native American communities — and central to championing hope for a brighter future in the impoverished reservation communities we serve. 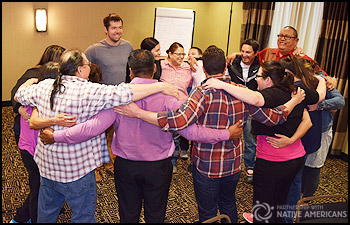 4 Directions Development Program (4D) builds capacity and enhances the personal and professional effectiveness of grassroots leaders who are serving Native American communities. 4D is really an investment in those who want to make a greater contribution to their tribal communities. 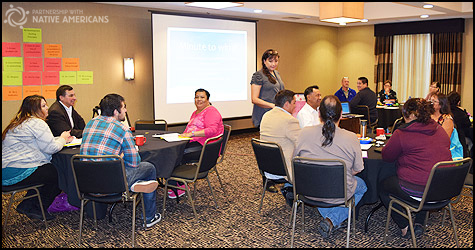 After reservation partners provided feedback to PWNA, and focus groups honed in on the specific training needs of community leaders, PWNA designed the 4D service. The result is that 4D is unlike any training offered in Indian country. Available in the Northern Plains and the Southwest, 4D is delivered in small but intensive cohorts for optimal learning. 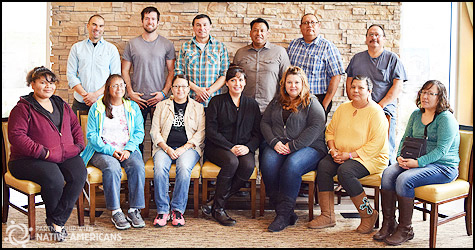 Emerging tribal leaders undergo a six-month experience of personal and professional development and work with PWNA staff and an advisor-mentor to reach self-identified goals. 4D is delivered in small but intensive cohorts for optimal learning. Jaime and Guenevere (Guena) work in the Crow Agency Family Preservation program in southeastern Montana. Openly sharing their reflections on 4D, they unanimously agreed the greatest challenge of the sessions was speaking before the group. “I didn’t have any public speaking skills. It’s hard for me — really hard for me,” Guena lamented. True to its purpose, the 4D curriculum moved them out of their comfort zone and into a space where talking to and within the group was a common thread woven throughout all the sessions. Jamie’s PowerPoint pictured descendants, chiefs and leaders in her family and tribe. 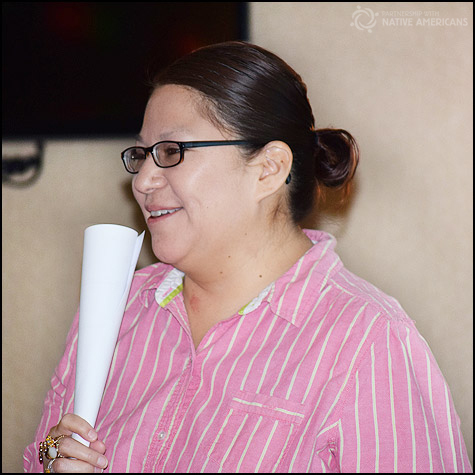 A consultant from the Rosebud Sioux Tribe led another session that would prove to be invaluable. During the presentation, both Guena and Jaime recognized the behaviors described and knew this was happening in their community. Learning new skills is one thing, but taking them from theory into practice among your coworkers is another. Yet, upon returning home, Jaime decided to share the Lateral Violence topic with her co-workers, pulling a reluctant Guena into the 30-minute presentation for 20 staff. “We ended up doing the training twice,” says Jaime, “and things calmed down.” Word travels quickly. Soon Jaime and Guena were training other departments upon request. Before their 4D cohort even completed, they had trained 50+ people on displaced frustration and aggression directed toward your peers. Guena recalled one of the homework assignments: to do something for herself. She elected to have a massage — her first ever. “I’ll probably do it again. I was really relaxed after,” she said. Jamie also felt that participating in 4D was taking care of herself. First 4D cohort celebrates their individual and collective success. During the closing ceremony, each participant gave a final speech. Jamie’s PowerPoint pictured descendants, chiefs and leaders in her family and tribe, a historical backdrop for her presence at the 4D cohort. Both women received a certificate of completion from their 4D advisor and PWNA staff. Partnership With Native Americans (PWNA) is a nonprofit organization committed to championing hope for a brighter future for Native Americans living on remote, isolated and impoverished reservations. 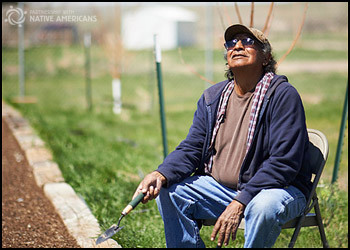 The organization collaborates with its reservation partners to provide immediate relief and support long-term solutions for strong, self-sufficient Native American communities. Established in 1990, PWNA works through its grassroots partnerships and distribution network to improve the lives of 250,000 Native Americans each year. For more information, visit www.nativepartnership.org.